Most of the time we reference Christmas Bible verses from Luke chapter 2 and Matthew chapters 1-2. Use these along with Bible verses from Genesis through Revelation to share the Gospel this Christmas season! The following can be used with your family, as a Christmas children's sermon, or with any other group as an interactive and fun way to share the Christmas story in a new, fresh way and including the message of God's promise through the Gospel! Tie a red piece of yarn in a bow around each person's index finger. Later reference it as a reminder to each of us to put that little red bow somewhere to remind us to keep Jesus and His gift of salvation through His blood before us during the Christmas season & beyond....or they can wear it on their index finger shopping, etc. as a conversation starter to share the Gospel! End by singing "Silent Night" together. Have a challenge to memorize Christmas Bible verses! Throughout the Christmas season see if one member can quote a verse followed by someone else with the next and then another with the next, etc. to tell different parts of the Christmas story. 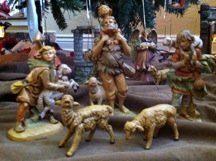 The Christmas story…where do we begin? In a manger? With the angels or a tiny baby? No…let’s go back to the beginning…way back to the very beginning – before mangers, before the angels, before any tiny baby or any other creation. The world God created was GOOD! It was perfect! But then something happened. You see, God created us (men, women, boys & girls) to know Him and to love Him. Love cannot be forced though; it must be a choice. So God gave each of us a choice to love Him back…or not to love Him back. God placed Adam & Even in a perfect place, but they chose to not trust God; they chose to disobey God. That’s called sin. They chose something else over loving God, and because of that, the world needed a Savior…we each need Jesus as our Savior! You see, before time began, before the world was created, God made a choice – a choice to love us – me, and you, and you…[may want to actually call out names of those present] and to give us “The Promise”. From the time The Promise was given in Genesis, God’s people watched and looked for the coming of their King, their Savior. 4 And Joseph also went up from the town of Nazareth in Galilee, to Judea, to the city of David, which is called Bethlehem, because he was of the house and family line of David, 5 to be registered along with Mary, who was engaged to him and was pregnant. 6 While they were there, the time came for her to give birth. 7 Then she gave birth to her firstborn Son, and she wrapped Him snugly in cloth and laid Him in a feeding trough—because there was no room for them at the lodging place. 16 They hurried off and found both Mary and Joseph, and the baby who was lying in the feeding trough. 17 After seeing them, they reported the message they were told about this child, 18 and all who heard it were amazed at what the shepherds said to them. 19 But Mary was treasuring up all these things in her heart and meditating on them. 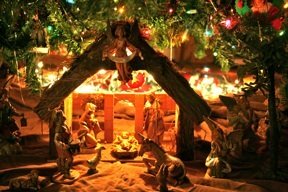 20 The shepherds returned, glorifying and praising God for all they had seen and heard, just as they had been told." 3 When King Herod heard this, he was deeply disturbed, and all Jerusalem with him. 4 So he assembled all the chief priests and scribes of the people and asked them where the Messiah would be born. 9 After hearing the king, they went on their way. And there it was—the star they had seen in the east! It led them until it came and stopped above the place where the child was. 10 When they saw the star, they were overjoyed beyond measure. 11 Entering the house, they saw the child with Mary His mother, and falling to their knees, they worshiped Him. Then they opened their treasures and presented Him with gifts: gold, frankincense, and myrrh. 12 And being warned in a dream not to go back to Herod, they returned to their own country by another route." “The Promise” came when that one silent night in the small town called Bethlehem, a child was born of a virgin. The Promise was given birth and breath filled His lungs as the only Son of God took on human flesh. God stepped down to earth and became a man to open the Way for mankind (each of us) to return to Him. So we see the Christmas Story didn’t begin in Bethlehem, but in the very beginning when God chose to love us and make a way for us to love Him back through choosing to trust Jesus as our Lord and Savior! What a Promise! And the Promise keeps pointing forward just as the wise men kept watching and following the star to lead them to worship King Jesus, so it should do the same for us. The Promise continues…He is coming back! May we keep watch in a spirit of worship! "Therefore, the Lord Himself will give you a sign: The virgin will conceive, have a son, and name him Immanuel"
"Bethlehem Ephrathah, you are small among the clans of Judah; One will come from you to be ruler over Israel for Me. His origin is from antiquity, from eternity." Why include Christmas Bible verses in your celebrations? Gods' Word does not come back void (Isaiah 55:11). As we speak and share the Word of God, it is living and active (Hebrews 4:12) and can change lives like no other words however eloquently spoken by humans. As a family, make sure to share Christmas Bible verses with your children so they may see that this is not just a "story", but a very real historical event. It is truth. Write Christmas Bible verses on small cards and use as place cards that can be read during your meal. Write Christmas Bible verses on strips of paper or cards and then cut in half. Give halves to different people as they come in and have them find their "other half". Then read the Christmas Bible verses out loud for all to share. Type out the Christmas Bible verses for the Christmas story leaving some blanks. Pass out sheets and see who can fill in the missing words correctly first.